However, we've got a load of GPIO pins on various interfaces. Would it be possible to recieve analog audio into the Pi via the GPIO? It is also possible to reconfigure GPIO connector pins P1-12 and 13 (chipset GPIO 18 and 21) to provide an I2S (a hardware modification may be required ) or PCM interface. However, PCM_FS and PCM_DIN (chipset pins 19 and 20) are needed for I2S or PCM. There seem to be references to this I2S connection all over the place, but nowhere giving a clear yes or no. "The PCM audio interface is an APB peripheral providing input and output of telephony or high quality serial audio streams. It supports many classic PCM formats including I2S." 20 pages of information on this subject alone. Like you said: not all the pins are available from the GPIO connector! 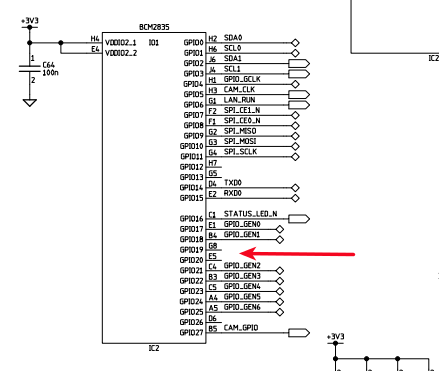 PCM_FS and PCM_DIN (the one you probably need) are not on the GPIO connector, you'll need to check the schematic to see if you can reach those in some way. Sadly connected to nothing! No chance to get anything connected to that!! What revision of the board is this? The Rev B 512M has all four PCM pins mapped to the P5 connector. You'll have to add your own pins to the board but use the under side to still make use of the GPIO connector on the front. On the schematic, Page 2, bottom left, look BCM2835-IO2 chip for the GPIO28-31 pins labelled as GEN7-10 corresponding to PCM Clk, Fs, DIn, DOut mapping to the P5 holes 3-6 respectively. This pin out would provide PCM when assigned as the Alt2 functionality. Not the answer you're looking for? Browse other questions tagged gpio audio or ask your own question. Sound card for raspberry pi? Can I use PWM with hardware audio input?